Pomegranates are a many seeded fruit about the size of a large orange, with a tough reddish-purple or reddish orange skin (There are also yellow, green and white varieties). The hundreds of small red edible seeds are surrounded by a reddish, juicy, jelly-like tangy pulp. Pomegranates are native to western Asia, but are now grown widely in Mediterranean countries, China and Japan. Pomegranates are unique fruits, and they have no close relatives. There is disagreement among taxonomists as to what family they belong to, and they are frequently placed in an order of their own, Granateae. Ancient Egyptians used the pomegranate in a variety of ways. The juice (called Schedou) was believed to fight intestinal worms, while the pomegranate blossom was crushed to make a red dye and the peel was used for dyeing leather. The pomegranate became so revered that representations of pomegranates were found on Egyptian wall paintings in tombs, symbolizing life after death. In fact, King Tut took a pomegranate vase into the afterlife with him. Muhammad, the prophet whose visions laid the foundation of Islam, considered the pomegranate to be a precious fruit filled with nutrition, bringing both emotional and physical peace. Legend has it that each pomegranate contains one aril descended directly from paradise. In Europe, the pomegranate initially appeared more prominently as a symbol than as a food, portrayed in art, literature, religion, mythology and heraldry. In later years Western culture has revered the pomegranate for its medicinal properties, with the fruit prominently featured on the heraldic crests of several medical institutions including the British Medical Association. 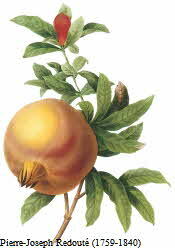 It is said that King Henry VIII of England planted the first pomegranate tree in Britain. In India, the pomegranate is thought to bring health and is a Hindu symbol of prosperity and fertility. During the Persian wedding ceremony, a basket of pomegranates is placed on the ceremonial cloth to symbolize a joyous future. In Turkey, after the marriage ceremony, the bride throws a pomegranate on the ground. The number of arils that fall out are believed to indicate how many children she will have. In Crete, when a bride enters her new home, the groom hands her a pomegranate. In China, a picture of a ripe, open pomegranate is a popular wedding present, expressing the wish, "May you have as many children as there are seeds!"